Sometimes gays bash back. One homophobe riding a bus in New York City found this out the hard way. World Star Hip-Hop brings us video of the unnamed man harassing and launching an attack against another man. It’s not clear whether or not the victim is actually gay, but he doesn’t appear to deny the charge. 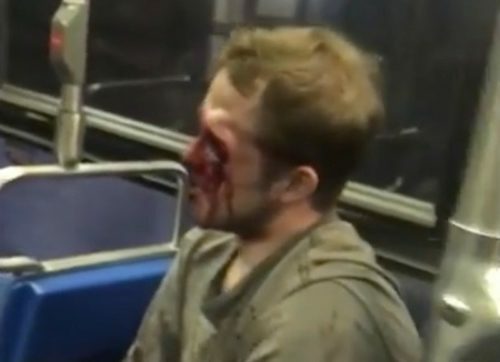 The victim turns to apologize to other bus riders for making a scene, but that’s when the homophobe launches his attack – and gets the snot knocked out of him. When other riders separate the two, the bloodied would-be basher gets thrown off the bus and into the waiting arms of police officers. Watch the video and try not to be overwhelmed with schadenfreude. If you’re on a mobile device and don’t see the video below, you can find it here.